This week Australia's Department of Communications and the Arts published its latest consumer survey on copyright infringement. The data reveal that while there are less Aussie pirates, they're pirating more. The recent waves of site blockades deter some people, although not as much as it may first appear. In recent years, entertainment industry insiders have often portrayed Australia as a piracy-ridden country. To see if these statements hold true, the Government conducts annual consumer surveys to study local piracy habits. In recent years, this has revealed a steady decline in piracy. 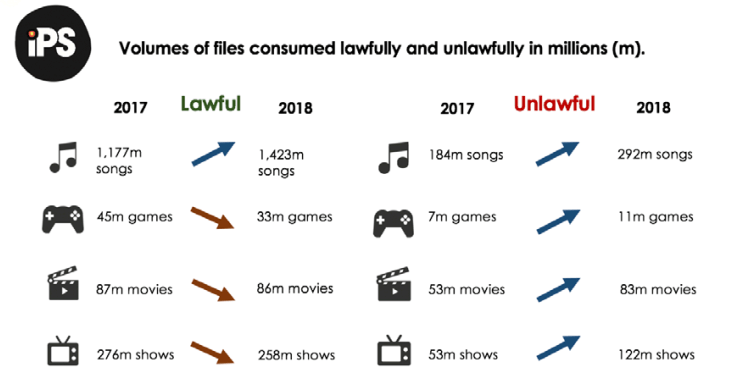 The latest online copyright infringement report, released this week, shows that there’s been a decrease in the number of people who consume music, movies, and TV shows illegally, compared to the year before. The only category where the percentage of pirates has increased is games, but the overall trend is clearly downward. In 2018, two-thirds of all Aussies consumed content through legal channels, compared to 57% three years ago. Interestingly, this pattern doesn’t automatically translate to higher spending. In fact, those who pirate and buy tend to spend much more on average, compared to those who purchase content 100% legally. This is consistent with previous research indicating that “hybrid” consumers (who pirate and buy) are bringing in the most money, probably because they are the most content-hungry consumers. Also, while fewer Aussies are pirating in 2018, they’re pirating more. The volume of illegally consumed digital content has grown across all measured categories, which includes music, games, movies, and TV shows. “When the proportion of lawful and unlawful digital consumption is applied across the Australian population, it can be seen that the proportion of unlawful consumption has increased across all four content types from 2017 to 2018,” the Government concludes. In other words, there are less Aussie pirates, but they’re pirating more. Another noteworthy finding deals with the recent pirate site blockades ordered by Australian courts. The entertainment industry argues that these will decrease piracy, and the report appears to back this up. 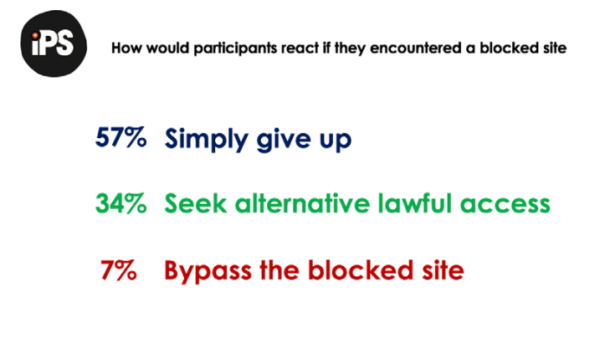 Of all respondents, only 7% say they will bypass a blocked site if they encounter one. An impressive statistic, but also very misleading. The 7% refers to all the people that were questioned. This also includes the 76% that don’t use pirate sites at all, who obviously have little reason to bypass a blockade. In addition, the graphic also leaves out the 10% who would find alternative pirate services. In other words, of ALL respondents, 17% would continue to pirate. This is quite significant, considering that little over 23% of all respondents are pirates. 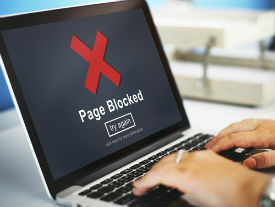 Finally, it’s worth looking at how Aussies would plan to bypass a blocked site. Among those who said they would, 30% would go for a VPN while 21% would opt for proxy sites. Google Translate, surprisingly, is the third most favored option with 15%. Whether these people will actually do this remains to be seen. The survey also asked those who encountered a blockade what their response was, and less than 1% said they’d bypass the block. Finding other pirate sources was a more popular option. All in all the report provides a good overview of recent media consumption trends, particularly where they apply to piracy. It shows that, increasingly, Australians are transforming into legal customers. The blocking efforts are somewhat effective as well, even though total piracy volumes have increased. Blocking aside, it appears that a lot of progress can still be made on the supply side. Most pirates indicate that they would stop if lawful services were cheaper, if the content they’re interested in is available legally, and if legal services were better.